RED MARS was first published in September 1992 (HarperCollins, UK) and received a wider release in February 1993 (Bantam Spectra, USA), thus beginning the release of the MARS trilogy. 2312, a novel reimagining a future like that of that trilogy and extending it further in time, was released nearly exactly 20 years later: May 2012 for the hardcover, and the paperback is coming in Summer 2013! To celebrate this anniversary, Ludovic Celle has created the montage below! You can find a higher definition version of that image here, or on Ludovic's Da Vinci Mars Design blog. Now, Muse Magazine has published an art photoshoot with Abramovic with about twenty photos, and Kim Stanley Robinson provided the accompanying text. This piece is a treat for the Robinson fan, mixing references to the world of Galileo's Dream, 2312, Swan's work and, as if there were a Galileo-like entanglement between Swan and her, back to our Abramovic -- or rather her imaginary alter ego in this space-themed photoshoot! The entire text is below, available here, but for the images you have to find the print magazine (the text makes more sense with the images, but the two that are here can give you a feeling). Every artist learns to fly in a different way. The images here are moments captured from Marina’s next flight. It hasn’t happened yet; these images come from the future, courtesy of Mnemosyne, the MUSE of memory, who remembers equally the past, present, and future. 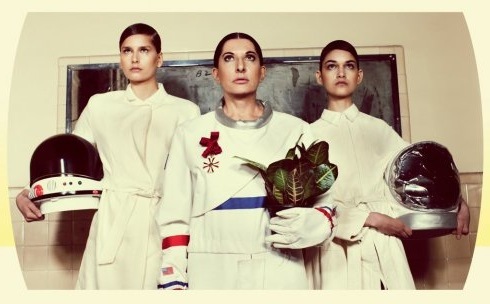 Marina Abramović, having over the course of a long career transformed performance art from a disorganized collection of gestures into one of the supreme human art forms, thus in the process becoming the queen of twenty-first century high art on Earth, decides to take off through time and space, on a tour of the city-states dotting the solar system in the year 2312. There are new worlds to conquer! She will fly like Icarus, and so crash and burn: not ignorantly or by accident, but on purpose, because one of Marina’s signature moves as an artist is what engineers would call “the test to destruction” - she jumps into her ideas and pushes them to their utmost limits, far beyond the bounds of safety. If there is a sun to fly into, that’s where Marina will be aiming her spaceship. Marina is a charismatic. Recall the etymology of that word: to have charisma is to be dealing with a wound. What is the nature of Marina’s wound? As a child she was brought up by atheist communist bureaucrat parents, and Serbian Orthodox patriarch grandparents, in a space once called Yugoslavia. There is no synthesis that will bring together all the antitheses she grew up with; her dialectical exploration of her life and times will go on ceaselessly, without any end or resolution. The stars are her destination. 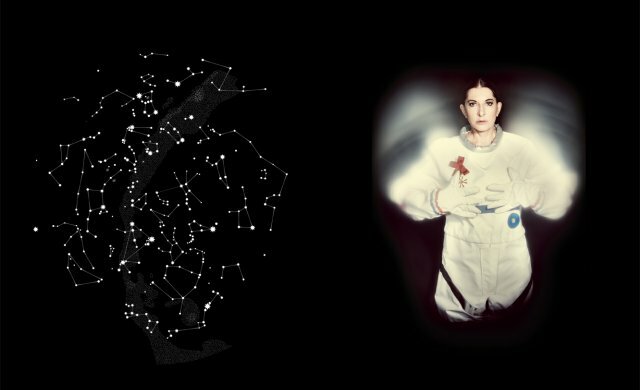 Do you see how the constellations crowding the night sky next to her spell out “ABRAMOVIĆ”? No? That’s because they are spelled out in the Cyrillic alphabet. her art, also in plucking images and experiences from her dreams, means she can fly under her own power when she wants to. And she often wants to. The blue disk on her uniform contains recordings of her performances. Most of the greatest examples of Terran performance art are here, from her violent, bloody, and dangerous confrontations of the 1970s, to her warm, generous, and startling recognitions of the early twenty-first century. In 2312, artists often simply speak of “doing an abramovic” especially if their performances are strange, difficult, or intense. The red ribbon and medallion she wears over her right breast is called the Rose of the Balkans, now one of her nicknames. In Marina’s youth, she cut the five-pointed red star of Yugoslavia into the skin of her own chest and belly. By her work over the years, by looking people in the eye, she slowly turned that bloody star into a rose. The Meeting: When Marina looks through her time telescope into the studio on Mercury, she sees a young performance artist, trying her best to animate the dead art of the past. All the craters on Mercury are named after famous artists, writers, composers, poets and painters: Goya overlaps Sophocles, Van Gogh and Cervantes touch at their rims, Chekhov and Michaelangelo are both double craters, Ovid stars the rim of the much larger Pushkin. In such a landscape as this, the young artists are completely confused and intimidated by the burden of the past. This young performer desperately needs help, and Marina can see that. The Fight: Marina therefore breaks into the time-space continuum of the young Mercurial artist, which tears the fabric of reality, and shocks the youth into a fighting response. Reality spins before her in a whirling snarl, and she perceives the newly arrived Marina as a deadly threat. To hold off the intruder with chopsticks: it isn’t really going to work. She needs to try something else, she needs to see the situation in a new way. Who is this intruder, why does she look so alluring, so full of possibilities? Put on the kind of protective lenses you would wear to look directly at the sun, and see better who it might be. The young artists of Mercury are so astonished and overwhelmed to have Marina flying into their world that they cannot help acting like statues when she is around. They are too scared to look at her. Above them, Marina’s route through the cosmos manifests as a torus, a wormhole through space and time. If you go in one side, you come out the other side, after an instant which is also an eternity:and you don’t come back the same. The Performance: The moment you cast yourself into a performance is a frightening one. A part of you must go away, that’s just the way it is. You give up your ego, your super-ego, your entire sense of self. Time to be the performance. Doing it in Marina’s style, the performance will include a big element of endurance. In this case, it looks like a month has passed. But is that one month? All months? It takes a while to get used to it, but for some, performing under the eye of Abramović is a transcendent experience. Under her eye a blessing descends on your heart, which is sometimes visible as a butterfly, as when Gabriel Garcia Marquez’s Remedios the Beauty was carried off to heaven in a flock of butterflies. I, the teller of this tale, have experienced this with Marina myself. The butterfly was yellow and black. The Come Back: Eventually the younger artists are ready to fly with Marina, off toward the sun. They are apprehensive, and so Marina carries kratom leaves, so she can offer the new fliers the soothing scents of the leaves, and later a tea made from them. For this flight they will need helmets: Marina will be holding her breath, which she can do for many hours at a time. She will be living through the young artists’ performances, and they will encouraged by her presence. As they perform, for the rest of their lives, they will always remember her as they saw her most, wearing the glasses she always wears when she is teaching the young, when she wants to see them at their best. Under this geeky, four-eyed, professorial gaze (Marina as Marion the Librarian, Marina as The Teacher Who Really Looks At You), the young artists blossom and fly! Try it yourself and you’ll see: for life itself is a performance. What will these young artists of Mercury’s performances be like, when they happen? Will Marina really come back to Earth, or is she gone for good? If she does come back, will she be the same Marina who left us so many centuries before? Will we be able to see her without wearing protection for our eyes? Will the room fill with butterflies? If we do see her, will we all then be on Mercury together? 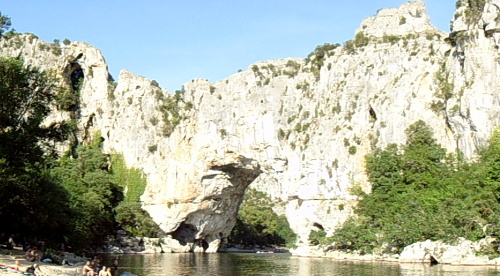 Developing themes touched upon in his Science In The Capital trilogy and 2312, Kim Stanley Robinson wrote an article for the onearth online magazine, "Earth: Under Repair Forever", dealing with...terraforming of Terra! i.e. geoengineering. For the rest of history, we will be required to work at repairing the damage we've already done to the biosphere. Geoengineering, then, has become our ongoing responsibility to life on this planet, including all human generations to come. 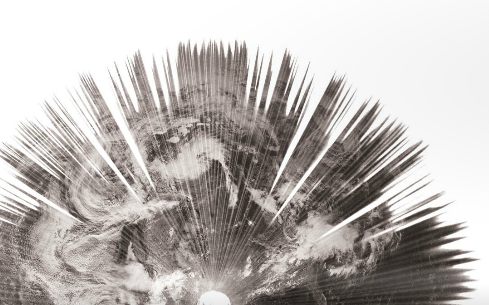 All of which leads to the question: can we actually design and accomplish any geoengineering projects that would mitigate or reverse climate change? Putting aside issues of political capability, are any of these projects physically possible? UK literary magazine Structo also featured Stan with an interview in its #8. Released in July 2012, it is now available online to read here. The interview, focusing on 2312 but not exclusively, is very enjoyable! A roundtable Q&A with authors Jacqueline Dutton, Daniel Heath Justice, Kim Stanley Robinson and Lorenzo Veracini. If I understand the term, settler colonialism describes my own situation as a person of European ancestry living in California, and so I suppose it has an impact on me implicitly, as I, like so many others, have to consider what it means “to become native to this place,” as Wes Jackson named the project. In my case, the central valley of California is now my home. It’s important to remember how it was here before the Europeans arrived—”the Serengeti of North America” as it has been called—and what it is now, a space of industrial agriculture, with a manipulated water system and greatly altered ecosystems. The hospitable world seems endless to our intuition—why else would so many dismiss climate change flatly?—yet our home is only a gossamer sheet on Earth’s surface, and even there only under specific conditions, and virtually the entire rest of the universe is unlivable without improbable technological feats. On a cosmic scale, our civilization is as fragile as the biofilm in a shower drain. Robinson manages, with Terminator, to convey awe at the fact that anything should exist in the first place, and the pleasure of exploration for its own sake. In addition to his thorough stage setting, Robinson continues to celebrate—more than most sci-fi authors—the actual humanity of his characters. One doesn’t have to work very hard to see the present in 2312, with half the world impoverished, the disparity between those with personal aircraft and those who dig their toilets unyielding, and so many denying we can ruin things for ourselves, even as libraries of evidence mount to the contrary. Ultimately, 2312 is an update, a continuation, and a condensation of Robinson’s themes: the importance of sustainability and stewardship; the sheer difficulty of any space activity, an incredible challenge still not sufficient to dissuade human ingenuity; and the joy of mindful experience at all, of being a person who can feel, think, wonder, and love. Consider how often Robinson’s characters, almost all inhabitants of futuristic science fiction, adjourn for coffee and pastries, or head to cook, dine, and clean at a communal kitchen, or relax by hiking, examining flowers, spotting birds. 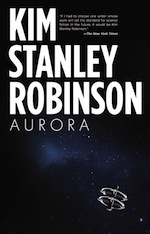 Robinson centers aggressive, progressive sci-fi stories, covering incomprehensible distances, on humans doing human things. In this way, Robinson is among the most humane of writers. Speaking of reviews, Bookbag on 2312. Floods, Interviews, Beethoven and Reviews! 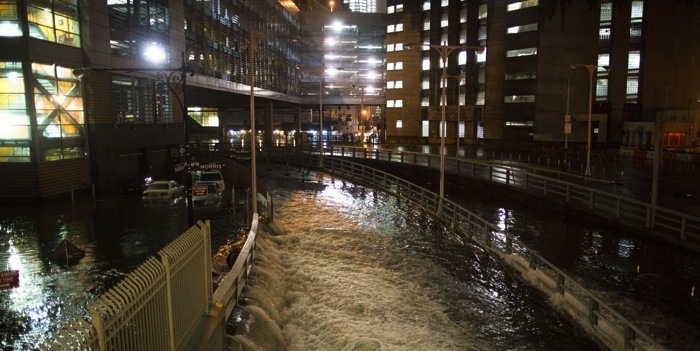 Pictured above: New York flooded by Hurricane Sandy, October 2012. These images should ring a bell in two different ways to KSR readers. First, there's the close-future Science In The Capital trilogy, wherein in Forty Signs Of Rain Washington DC is tragically flooded in the midst of undeniable climate change; an unhappy event like Hurricane Sandy. And then there's the far-future 2312, where climate change and rising sea level has made of New York City and Manhattan island in particular a Venice of the future, where tall buildings directly emerge from the water and the scenery is full of overhead bridges and piers; a description that is far away from the flooding as it was lived by today's New Yorkers, but a description of a city of which its inhabitants are very much proud of on 2312! Photo by John Minchillo. In a short video interview for io9, Kim Stanley Robinson evoked the novel that got him into science fiction: Clifford D. Simak's The Goblin Reservation. It's relatively unknown, but it was a 1969 Hugo Award nominee; interestingly, John Brunner's Stand on Zanzibar won that year, and that novel had a much more obvious influence on Stan's 2312! What is the basic difference between the Kim Stanley Robinson who compiled the Mars Trilogy and the KSR who wrote 2312? Twenty years or so! As a writer, I think that has made me less patient, and more interested in trying different structures and narrators. Starship Sofa's podcast #249 has a recording of Stan's short story "The Timpanist of the Berlin Philharmonic, 1942", narrated by Diane Severson. The story appeared in 2010's The Best Of Kim Stanley Robinson. Finally, Kim Stanley Robinson will be appearing at the Humanity+ conference on "Writing the Future" in San Francisco, on December 1-2. He is scheduled at 10am on Saturday December 1. The subject of his talk? I want to explore the relationships between science, science fiction, and society, with a view toward seeing where science fiction might help us to shape our efforts in the present to make a better future. Read more about Floods, Interviews, Beethoven and Reviews!